VLC is famous for its powerful media playback capability. But aside from playing video, music and others, it is also available to convert discs and videos to MP4, MOV, MKV, AVI and more. Do you want to convert your video to the most popular video format MP4 with VLC converter? Let me walk you through the process. VLC doesn't work for MP4 conversion? It is too slow? It delivers low-quality or corrupted file? 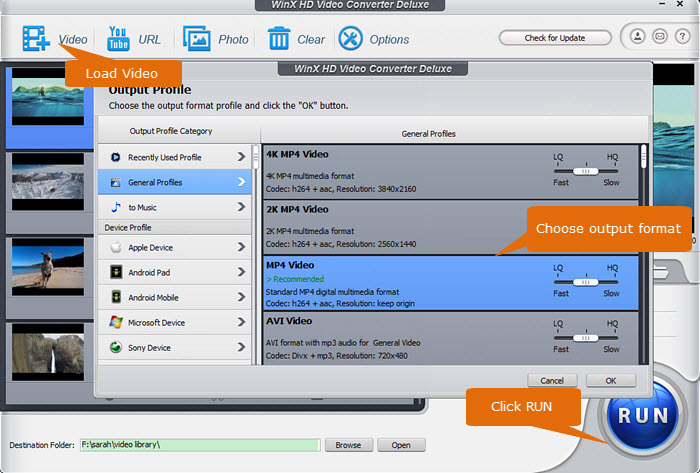 Here's a powerful alternative - WinX HD Video Converter Deluxe. This tool can convert nearly any video format such as MKV, AVI, and AVCHD to MP4 H.264/H.265/MPEG4 while keeping high quality. And, it works up to 47x real-time faster thanks to full hardware acceleration. Additionally, it is integrated with DVD converter, video/music downloader, screen and webcam recorder. How to Free Convert Video to MP4 with VLC Video Converter? To begin with, we should download and install VLC media player on our computer. VLC is a cross-platform program that is compatible with Windows, Mac, and Linux. Make sure get the right edition downloaded. Next I'll illustrate how to convert video to MP4 with VLC (v3.0.4) Windows edition. Mac and Linux editions follow the same rules. Step 1. Open VLC media player, click Media at the top left corner, scroll down and choose Convert / Save. Step 2. Click + Add button to load the video file(s) you want to convert to MP4. Alternatively, you can directly drag and drop them to the box. Next, click Convert / Save button at the bottom. Step 3. Go to Profile, and click its drop-down button to choose your desired output format. Can't find MP4? You can create MP4 profile by yourself. Click Create a new profile button -> specify a profile name such as MP4 - H.264 + MP3, choose MP4/MOV under Encapsulation -> move to Video codec tab, check Video, and select H-264 under Codec -> move to Audio codec, check Audio, and select MP3 -> click Create. Then, you should see the newly created profile in the list. Just select it. Step 4. Select the destination folder and the name for the resulting MP4 file. Step 5. When all settings are done, simply click Start button to begin converting video to MP4. And then you should see the progress in the timeline. Since VLC isn't a specialized video converter, it always doesn't work well and has been met with many complaints. "It converted to mp4 but it has no audio." "It DOES work, and very well, too, except that it is rather slow." "It simply does not work. I tried converting from MKV to MP4, and the file is corrupted and not working." "Used to work fine on my old computer, but now every conversion ends with failure. Put the quality at 99, but the videos always end up blurry and grainy." If VLC's inbuilt video file converter can't help you convert video to MP4 successfully, you can give WinX HD Video Converter Deluxe a try. This is a professional, easy-to-use, and fast MP4 video converter that can convert almost all videos to MP4 with high quality. Let me show you its workflow. To begin with, we should download and install WinX HD Video Converter Deluxe on computer. This VLC alternative is compatible with Windows and Mac. Step 1. Launch WinX HD Video Converter Deluxe, click + Video to load the videos you want to convert to MP4. If you prefer dragging-n-dropping, then do it. Step 2. Go to Output Profile and choose a MP4 profile. You can choose MP4 encoded with H.264, HEVC, or MPEG4 video codec and MP3 or AAC audio codec. Click Target Format and you will find there're more MP4 profiles optimized for all popular devices like iPhone and Android and video platforms like YouTube and Facebook. Step 3. Hit RUN, and the video to MP4 conversion will be started immediately. It works much faster than VLC and other competitors thanks to the support for Intel/NVIDIA/AMD powered level-3 hardware acceleration. [Solved] How to Fix "VLC Won't Rip DVD" Problem on PC/Mac?